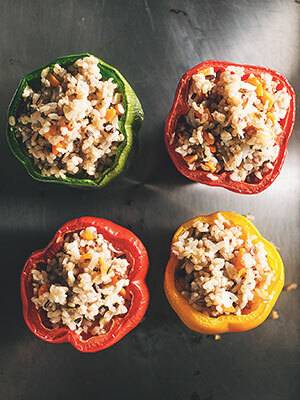 This healthy make-ahead recipe will give you a great head start on your daily meals. From The Stash Plan. 2. The next day, rinse the rice in a strainer until the water runs clear. Place the rice in a 4-quart saucepan. Add broth, 2 cups water, and salt. Cook on high until the rice begins to boil, then reduce flame to low, cover, and cook for 30 minutes, stirring occasionally. Stir, then allow to cool. 3. Preheat over to 350°F. Cut off tops of peppers and core them. Wash out seeds. Mince carrot, onion, and garlic. 4. Heat olive oil in a sauté pan, then add carrot, onion, and garlic. Cook for 5 minutes, stirring occasionally. Add brown rice, then cook for another 2 minutes, stirring constantly. 5. Stuff rice mixture evenly into peppers. Place peppers on a baking sheet and roast for 20 minutes. 6. Allow to cool, then transfer to a glass container. 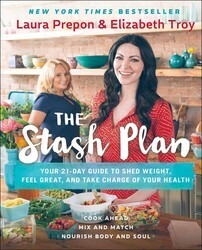 From Laura Prepon, star of Orange Is the New Black, and integrative nutritionist Elizabeth Troy comes an exciting 21-day plan combining the latest in food science with ancient dietary wisdom, to shed stubborn weight for good and achieve overall wellness. In The Stash Plan, you’ll learn what to cook and how to create a combinable “stash” of meals—proteins, carbs, and vegetables—and nutritional bone broths to eat throughout the week. Laura Prepon is a versatile actress whose career spans both film and television. She made her television debut on the long-running sitcom That 70’s Show and can currently be seen in the hit Netflix original series Orange Is the New Black. Elizabeth Troy, RD, IN, has been an Integrated Nutritionist and well-being coach for more than twenty-three years. She received her Masters Degree in Teaching from Teachers College at Columbia University, and is a certified teacher of yoga and Thai muscle massage and practitioner of Chinese Meridian Theory.